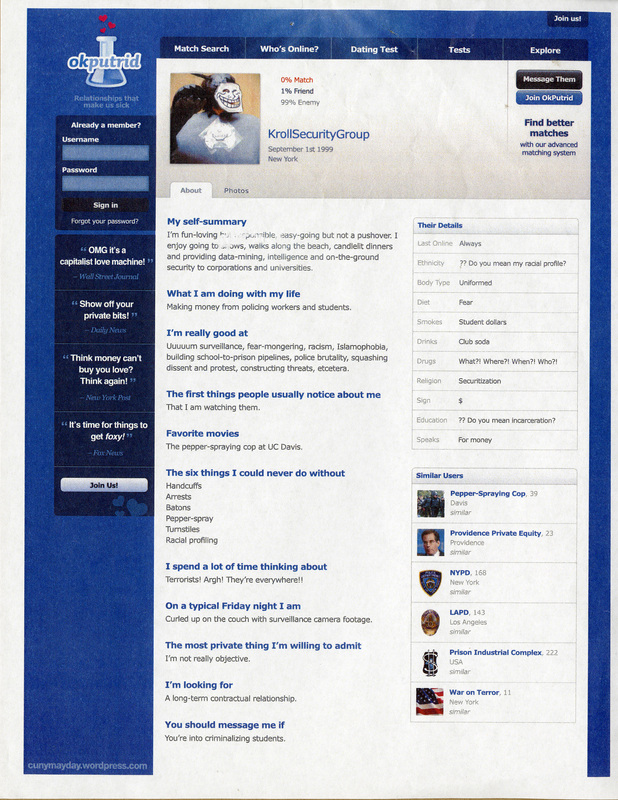 This mock okCupid (online dating site) profile was made for Kroll Security Group. The summary describes him as enjoying providing data mining, intelligence, and on-the-ground security to corporations and universities and that he is “looking for” long-term contractual relationships. Chancellor Matthew Goldstein's hired Kroll Security Group to conduct a biased investigatory report about a November 21, 2011 incident at Baruch College. On this date, NYPD and CUNY security clashed with people (students, faculty, staff, and community members) who were attempting to peacefully enter a Board of Trustees public hearing on a 5-year tuition increase. On May 8, 2012, after the John Jay College Chairman and head of Kroll, Inc., Jules Kroll, donated $2 million to the college, the "Lynn and Jules Kroll Atrium" was unveiled. On January 4, 2013, Kroll, Inc. released a report absolving CUNY of any wrongdoing in the Baruch College incident. Rights | Copyright CUNY May Day This work is licensed under a Creative Commons Attribution-NonCommercial-ShareAlike 4.0 International License. Cite This document | CUNY May Day, “Okputrid: Kroll Security Group's Profile,” CUNY Digital History Archive, accessed April 19, 2019, http://cdha.cuny.edu/items/show/6592.